Dealing with oppositional defiant disorder in kids can be downright overwhelming. These children seem to make it their life’s mission to defy the rules and cause chaos and upset to those around them, leaving even the most patient of parents and teachers feeling exhausted and defeated. If this sounds like you, read on for 18 of our best tips for dealing with oppositional defiant disorder at home and in the classroom. While most kids go through a phase (or three) in which they try to test the boundaries of their parents and other figures of authority, oppositional defiant disorder (ODD) is a behavioral/defiance disorder that takes things to a different level. A child with ODD is argumentative, appears angry, aggressive, and irritable, gets frustrated easily, doesn’t respect people in a position of power, and is vindictive. Oppositional defiant disorder can occur in all children, but research has shown that it’s more prevalent in kids with ADHD/ADD, conduct disorder, mood disorders, and anxiety disorders, and it tends to affect boys more than girls. *Note: This is not an exhaustive list of oppositional defiant disorder symptoms. Please consult with your child’s medical practitioner for further information if you suspect your child has ODD. Some children outgrow ODD, whereas others don’t develop symptoms until they reach puberty, and while boys tend to display more physical symptoms of oppositional defiant disorder (aggression, explosive anger, etc. ), signs of ODD are a little more subtle in girls (lying, refusing to cooperate, etc.). Make sure other conditions and challenges are under control. As previously mentioned, certain conditions like ADHD, mood disorders, and anxiety can cause or worsen the symptoms of ODD, which makes it more important than ever to get these challenges under control first. Consult with a trained mental health professional to confirm the reasons behind your child’s behavior so you can better understand how you can support her and which treatment options you should prioritize. Keep the list in a place your child frequents throughout the day (her room, the fridge, next to the TV, etc.) so you can review it together often, and if you find your child struggling to follow the house rules you’ve set forth, consider turning it into a reward chart whereby your child earns a small reward for successfully following a certain number of rules each day (i.e. if your child earns 4 of 6 check marks, she gets an additional 15 minutes on her iPad after school). Opt for positive over negative reinforcement. Reinforcement is a great tool for dealing with oppositional defiant disorder in kids, and while both positive and negative forms of reinforcement can be helpful, research supports the idea that positive reinforcement – the act of rewarding a child when she completes a desired behavior as a means of increasing the likelihood she’ll repeat the behavior again – is more effective. Sticker charts are a simple, yet effective form of positive reinforcement that can be extremely successful in helping kids with ODD, and I love this Magnetic Reward and Responsibility Chart as you can easily customize it for your individual child. Use natural and logical consequences. While most parents are aware that consequences can teach children responsibility, accountability, and problem-solving, very few know what types of consequences are effective, and how to use them properly. Natural consequences occur inevitably as a result of a child’s behaviors or actions (if your child refuses to eat, she’ll feel hungry), whereas logical consequences require thought and involvement from someone else, such as a parent, teacher, or caregiver, and are designed to help children replace poor behaviors with more appropriate choices (if your child refuses to pick up her toys after being asked, the toys are taken away for a certain period of time). Both can be powerful methods to help parents discipline a child with ODD, but since natural consequences don’t always occur as a result of poor behaviors, logical consequences are a more effective strategy all around. Not sure how to use logical consequences in relation to oppositional defiant disorder in kids? CLICK HERE for 13 examples of logical consequences that work! Be consistent. There’s no doubt that dealing with oppositional defiant disorder in kids can be extremely challenging, and while it can be very difficult to stand your ground in the face of your child’s explosive anger, consistency really is key. Remember that your child’s goal is to wear you down so she can get what she wants, and when you oblige and give into her demands, you’re teaching her that your rules are meaningless. So, no matter how hard it feels in the moment, always stick to your guns! Avoid power struggles. Another great tip for dealing with oppositional defiant disorder in kids is to avoid power struggles at all costs. Try to be as calm and to-the-point as possible, and avoid arguing with your child to the best of your ability. Identify problem behaviors, explain the logical consequences they entail, and then remove yourself from the situation so as not to inflame things. I realize this is easier said than done, but when it comes to helping kids with ODD, finding ways to stay calm and disengage when needed is key. Engage in positive interactions. Children who have behavioral disorders like ODD receive a lot of negative feedback throughout the day. Teachers and parents spend a lot of time telling these kids about all of the things they’re doing wrong, and while this isn’t always done deliberately and is often prompted directly by the child, it can negatively impact your little one’s feelings of self-worth. So, no matter how disruptive and misbehaved your child has been, find ways to connect with her, offer praise wherever possible, and make it a point to highlight one (or more) things your child does RIGHT each day. Give warnings before transitions. Another simple yet effective strategy for dealing with oppositional defiant disorder in kids is to provide warnings. For example, if your little one gets angry when it’s time to put her iPad away, consider purchasing a Time Timer so she can visually see her allotted iPad time pass, and then give her a 10-, 5-, and 3-minute warning so she isn’t totally caught off guard. Prioritize sleep. My last tip for parents who are dealing with oppositional defiant disorder in their children is to make sure the whole family is getting enough sleep. Sleep plays such an important role in our child’s development and well-being, and a lack of restful sleep can exasperate the symptoms of oppositional defiant disorder and other mental health conditions that can cause or exasperate the symptoms of ODD. Sleep deprivation can also lead to a whole host of challenges for parents and caregivers. They become anxious and irritable, depressed and withdrawn, and start to lose interest in the things that are happening around them. Life starts to feel like an uphill battle, and since a child’s success with various treatments and therapies is very much dependent on the involvement of her parents and caregivers, it’s extremely important the entire family is getting an adequate amount of sleep each night. Use reward charts. Sticker charts are a simple, yet effective form of positive reinforcement when helping kids with ODD. They can be used for a specific behavior (aggression), or as a way to reward overall good behavior throughout the day (being respectful, taking turns, using manners, following directions, etc.). Each time a child earns a certain number of stickers, a bigger reward is often given to keep the momentum going. Create a calm down corner. Designating a certain area of your classroom as a ‘Calm Down Corner’ where students can take a break when they feel overwhelmed can be very powerful, particularly when it comes to helping kids with ODD. You may need to prompt your students at first (‘I notice you’re feeling frustrated. Why don’t you go to the Calm Down Corner to read for a few minutes?’), but teaching children how to recognize their emotions and equipping them with strategies to calm down before things get out of hand is extremely valuable. There are many things you can keep in your classroom Calm Down Corner to help your students gain control over their emotions, including books, noise cancelling headphones, calming coloring books and crayons, playdoh, and a variety of classroom-appropriate fidget toys. Provide choices. It’s no secret that children like to be in control of their own destiny, and while classroom settings don’t really lend themselves to offering a million different choices to each individual child, this is one of the oppositional defiant disorder strategies that is extremely effective in helping kids with ODD. Remember to limit the number of choices (2-3 is best), and if there’s an activity or assignment you would like the child to complete, try pairing it with one or 2 less desirable options. This way, the student is likely to choose your preferred option, but she feels she made the decision herself and will be a much more willing participant due to an increased sense of control. Provide positive feedback. As mentioned in the strategies above for dealing with oppositional defiant disorder at home, it’s important to remember that kids with ODD are subject to a lot of negative interactions throughout the day. Their parents, teachers, caregivers, and even their friends are constantly pointing out the things they’re doing wrong, and the long-term implications can be pretty powerful. So, as difficult as it may sometimes seem, try to find ways to connect with these children. Find out what makes them tick so you can appeal to these interests and keep them motivated, offer praise wherever possible, and find a way to highlight at least one thing these children do right each day. Allow more breaks. Kids who are irritable, angry, and prone to emotional outbursts can benefit from taking regular breaks throughout the school day. When you sense these students becoming frustrated, give them a signal to head over to the classroom Calm Down Corner for a break, or organize another activity they can engage in to distract them from their feelings. For example, you may ask them to hand out papers to the class, run a note to the office, or help another student who is struggling. Remember that you want to find positive ways to interact with these children, so use your best judgement and don’t be afraid to be creative when you sense negative emotions brewing. Be clear and consistent with rules and expectations. Dealing with oppositional defiant disorder in the classroom can be difficult for even the most experienced and well-grounded teachers. There will be days when it feels easier to give in to what the child wants, and while this may help you in the short term, it will make things more difficult in the long-run. Taking the time to communicate your rules and expectations at the beginning of the school year, and holding firm with them no matter how angry or argumentative your students become will not only help you remain in control of your classroom, but will also have positive impacts on all of your students. Even though they may not like all of your rules, the predictability and consistency you set forth will have a positive impact on their success throughout the school year. Avoid power struggles. Another great tip for helping kids with ODD is to avoid power struggles like the plague. When a student starts to become argumentative with you, remind her of your expectations in clear and concise language as well as the consequences she will endure if she fails to follow your directions, and then walk away. Do not engage in back-and-forth dialogue as this will only escalate the situation. If the child does not do what has been asked of her, deliver the consequence and remain as neutral as possible. Use visuals and give warnings before transitions. Created using pictures, icons, words, etc., visual schedules are a visual representation of a sequence of events. Most classrooms use a basic schedule outlining the different activities students will be participating in throughout the day (this Daily Schedule Pocket Chart is a great option), but some children benefit from a more detailed outline of exactly what will happen from one moment to the next. This will ensure they know what is expected of them so they can plan ahead, allowing them to remain more in control of their emotions. Giving warnings before transitions can also be beneficial in kids who struggle to move from one activity to the next. This is especially important when they are moving from a preferred activity to something they find less interesting. A Time Timer is a great tool to use as it visually shows kids the passage of time, and providing a 10-, 5-, and 3-minute warning can also help make transitions easier. Be patient. My last tip for dealing with oppositional disorder in the classroom is to remain patient. Remember that the behaviors you are seeing are not a personal attack on you, so try not to take things personally. Find ways to connect with your students so you can better understand them on a personal level, and offer positive interactions wherever possible. When you sense yourself becoming frustrated, walk away, and make sure to engage in regular self-care outside of classroom hours so you can be your best self at school, at home, and beyond. I hope this collection of tips for dealing with oppositional defiant disorder at home and in the classroom proves useful to you. Remember to set clear boundaries, avoid power struggles, use positive reinforcement, and set forth logical consequences for poor behavior, and find ways to connect with and offer praise to the ODD children in your life. 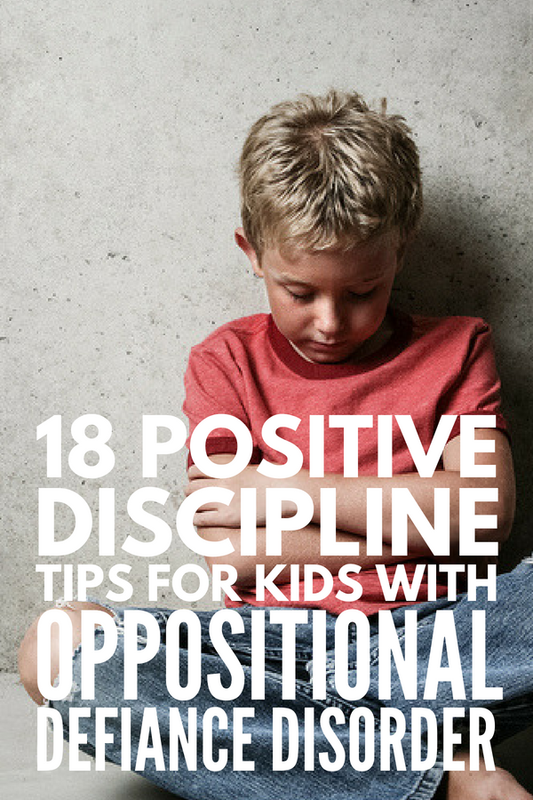 If you found these tips for dealing with oppositional defiant disorder in kids helpful, please share this post on Pinterest! And if you’re looking for more parenting tips and tricks, please follow our Parenting board where we share all kinds of helpful advice we find each day!